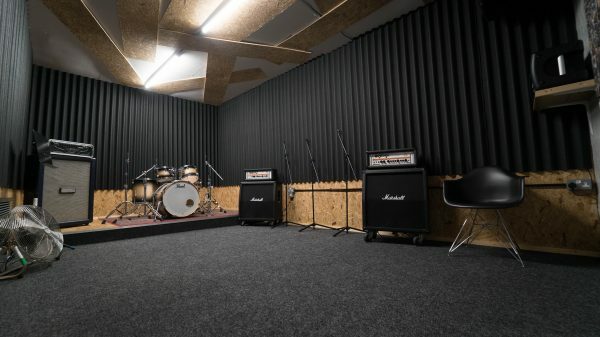 OUR HOURLY REHEARSAL STUDIOS all include a drum kit, 2 guitar amps, a bass amp and a vocal PA.
Cymbals, microphones and stands are also included in the price. Keyboards and extra leads are available free of charge from reception. 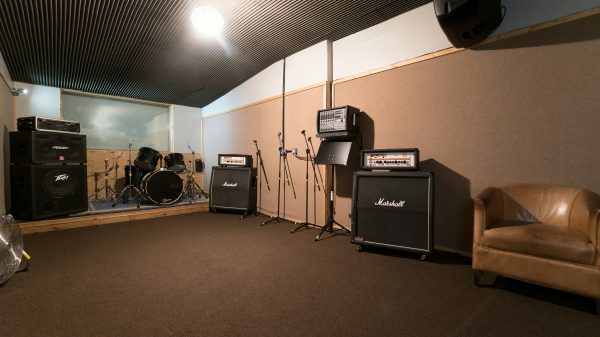 Rooms 1-3 are moderately sized rehearsal spaces and can easily accommodate up to 6 people. 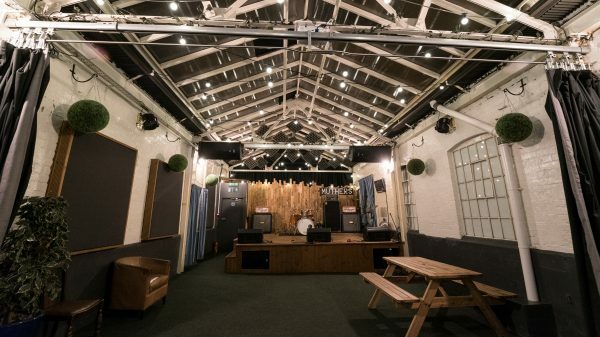 These rooms are priced £6 per hour before the hours of 6pm Monday to Friday and £8 per hour at all other times. DRUMS:Pearl vision birch. BASS: Sansamp Tech 21-NYC/Crown XLI 800 with Peavey 1×15 & 2×10 speaker cabinets. GUITARS: 1x Blackstar 1D100TVP valve modelling amp & Laney 4×12. 1x Marshall MG100HDFX original & Laney 4×12. PA: Yamaha EMX312sc 600w Amplifier. DRUMS:Pearl export. BASS: Sansamp Tech 21-NYC/Crown XLI 800 with bespoke 2×10 speaker cabinet. GUITARS: 2x Orange CR120 amps with Marshall 4×12’s. PA: Mackie PPM 608 1000w Amplifier. DRUMS:Pearl vision birch. BASS: Sansamp Tech 21-NYC/Crown XLI 800 with Peavey 1×15 & 2×10 speaker cabinets. GUITARS: 2x Orange CR120 amplifiers with angled Marshall 1960’s 4×12’s. PA: Mackie PPm608 1000w Amplifier. 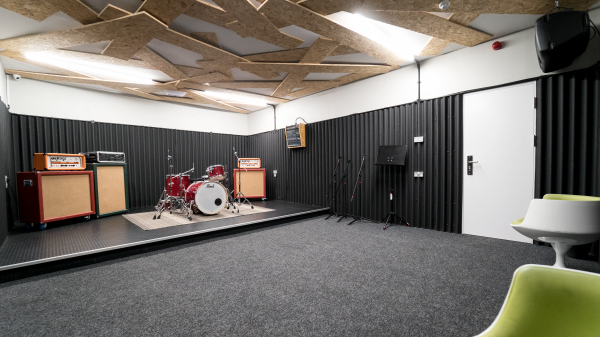 Room 5 is our newest premium rehearsal space and can easily accommodate up to 20 people. This room is priced at £10 per hour. DRUMS: Pearl export. BASS: Sansamp Tech 21-NYC/Crown XLI 800 with bespoke 2×10 speaker cabinet. GUITARS: 1x Blackstar 1D100TVP valve modelling amp & Laney 4×12. 1x Marshall MG100HDFX original & Laney 4×12. PA: Yamaha EMX312sc 600w Amplifier. The Stage is the best way to practise for a gig or record live. The monitors are in front of you, all the back line is ready to go and can easily hold a large band. 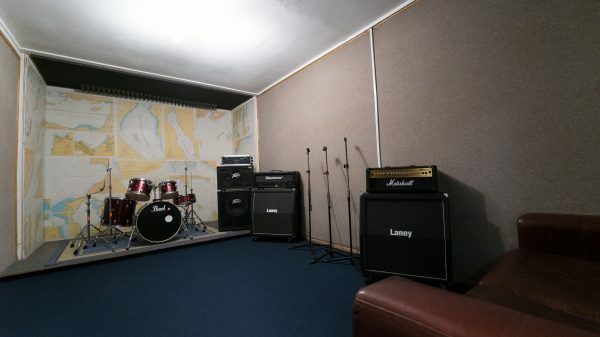 This room is priced at £15 p/hr for rehearsals and £30 p/hr for recording. DRUMS:Pearl export. BASS: Sansamp Tech 21-NYC/Crown XLI 800 with Ampeg SVT810 speaker cabinet. GUITARS: 2x Orange TH130 30w Valve amps & bespoke 4×12 speaker cabinets. PA: Yamaha EMX312sc 600w Amplifier. To book a rehearsal or for more information please use the contact form below or telephone 0121 622 7110.